This module uses the newest 2.4GHz transceiver from Nordic Semiconductor, the nRF24L01. This transceiver IC operates in the 2.4GHz band and has many new features! 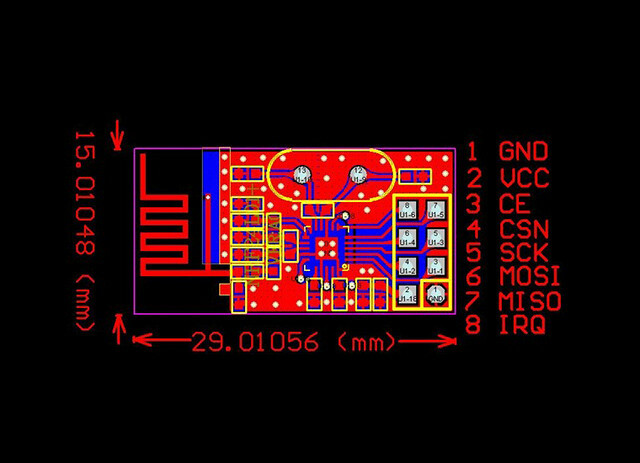 Take all the coolness of the nRF2401A and add some extra pipelines, buffers, and an auto-retransmit feature. Now we make a breakout for nRF24L01 , and build the smallest system for it , also the wireless circuit . You can use it in you project without any wireless design , just need to leave a 8 pins interface to this module , use the SPI interface to control the module on transferring data. nRF24L01 Module information : Download the zip include all the file here.